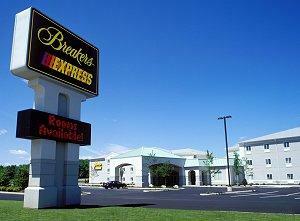 Breakers Express is a Cedar Point resort. A stay at the Breakers Express Cedar Point resort may not be fancy, but it can be an affordable and attractive way to visit one of the world's largest and most highly rated amusement parks without breaking the bank. Despite its simplicity, this hotel offers a range of benefits for guests to enjoy when they visit Cedar Point amusement park. Breakers Express is an official Cedar Point resort property located at the base of the Cedar Point peninsula. With 350 rooms, the hotel has been an affordable and convenient option for many park guests since it first opened in 2000. Breakers Express is closer to the park than any other hotel except two other hotels at Cedar Point, the historic Hotel Breakers and the luxurious Sandcastle Suites, and it is closer to the park than any non-Cedar Point resort properties. The best amenity that Breakers Express offers is that hotel guests have the privilege of entering Cedar Point an hour before non-resort guests. This early-entry feature allows resort guests to take advantage of certain rides that are already open, getting a head start on all the park's fun. In 2009, the available rides (subject to weather conditions and mechanical maintenance) included Raptor, Maverick, Millennium Force, Iron Dragon, and Planet Snoopy. During the early entry period, the lines for these rides are much shorter than they will typically be during the rest of the day, and resort guests can also choose to be first in line for the other park rides that will open an hour later. For more information about Breakers Express or to make a reservation for your next Cedar Point theme park getaway, visit online or call (419) 627-2106. The Breakers Express Cedar Point hotel is an economical, no frills property but it does offer guests affordability and convenience if they are planning a visit to Cedar Point. The money saved can be well spent by staying longer to enjoy all the park has to offer, making a trip to Cedar Point truly unforgettable.